After putting another batch of these tubs in the freezer containing various homemade sauces/stock my mind wandered as to how many of these humble and simple tubs we have dotted around the house fulfilling a multitude of roles. When younger we used to turn them into boats and race them down the local river or use them as fishing bait boxes (sorry about the white maggots that got forgotten about in the fridge all those years ago!) but now I have grown up ( ) they are used for more sensible (but not so much fun) things. I've already mentioned the freezer storage but what about all the others that contain nails, screws, buttons, seeds etc. the list of items stored in them is endless, then there are those in the animal feed bins being used as scoops not forgetting the ones that are currently being utilized as food and water bowls in all the rabbit/bird runs. Earlier in the year they were being used as seed starter trays and beer traps for them pesky slugs then moving on to the dreaded DIY, they have been utilized for mixing up filler, used as paint tubs, for cleaning brushes and also used as small oil baths I have even cut up the lids to use as flexible spreaders. Currently we even have several of them threaded on string and surrounding our herb garden as a deterrent to the wild birds and our chickens, may not look pretty but they work! We have used them as ant traps, mice/rat bait stations, for catching spiders, scorpions and beetles in the house before releasing them outside the list is endless and goes on and on, so my little treasure of a margarine tub I thank you for being so versatile, useful and humble and I apologize for taking you for granted for all of these years and I also apologize for making you float over the white water rapids as a boat before attempting to sink you with the lucky throw of a stone. PS. I understand this humble and versatile tub is hard to recycle and its normal final place of rest is a landfill site, I am sure someone out there will correct me if I have that wrong. 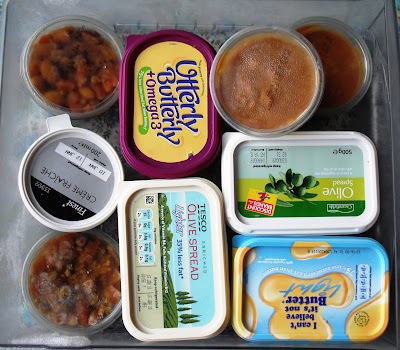 I use ice cream tubs alot in the freezer which I must have had about 15 years! Better to re-use what we have than go & buy expensive tubs which are the same! So here's a second salute for humble tubs!!! By the way we can put them in our recycle bin here in Warwickshire. You can also use both margarine and ice cream tubs as seed pots with a few strategically placed holes in the bottom. If a tub is the right size, nice and sturdy and with a lid it is saved for the feezer. Also used for fridge storage and keeping odds and ends. Why buy!! Forgot to say I have also cut the lids of these wonderful tubs up to use as guitar picks, they did not improve my playing though!! I collect them. Have lots of tubs and lots of lids ... do they match... guess! They multiply through the year then all vanish as I freeze or give away my harvest. I've cut a tub up and used it recently for labels to identify different orchids when they stopped flowering. OH has used them as labels for seedlings. They are versatile, aren't they! I make a pan of stew from cheap vegetables and portion it out into margarine tubs and smaller potato salad tubs, then freeze them. They are my ready meals. I microwave them in a small pyrex dish. The frozen block can be difficult to get it out of the container, so I waft a hairdryer over the outside for a minute or two.